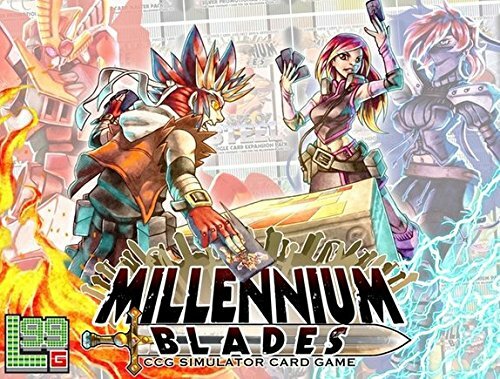 Millennium Blades Review – YOU'VE ACTIVATED MY TRAP REVIEW!!! — GamingWithSwag.com - Dads By Day, Gamers By Night. HAHA! By opening this article you've activated my TRAP CARD (what did you think the title was lying?)! What's that you say? You'll counter it with your Discerning Reading Spell!?! Hmmmmmmm this is quite the predicament I've gotten into. If I summon my Molten Clickbait Beast they may just flee the site forever. Wait, I know what to do! If I lure them in with my Exciting Premise Blue-Eyed Ultimate Dragon Card then there's no chance they won't read this review! 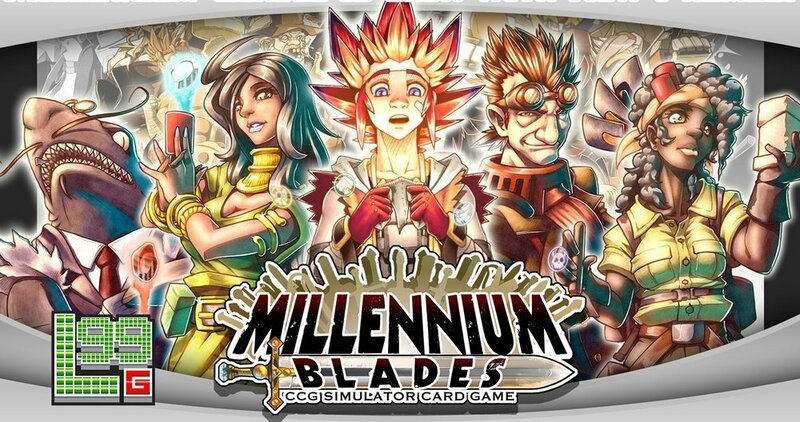 Millennium Blades is a collectible card game tournament simulator. Now I know that description alone might turn some people off but this is one of the most unique, smoothest running games I've played in a while. Each game consists of 6 alternating rounds of deck building and tournament play. You score points based on collections you've sold and tournaments you've won. Playing two players the winner is simply the first person to win 2 tournament rounds. Each deck building phase is is split into 3 timed sub-rounds with players getting 6 “booster packs”, represented in the abstract by the cards in the game, at the start of each sub-round. During these rounds players can buy more booster packs, buy and sell cards on the aftermarket, trade with other players or to the bank for promos, and arrange their cards into one “deck” and collections based on cards of the same type. The coolest thing about this is that there is no turn order during deck building! Player just wheel and deal freely until the timer runs out. At the end of the phase they trade collections to the bank for points, grab the 8 cards they put in their deck, and flip the player board over for the tournament round. During the tournament round players take turns where they place a card from their hand to score ranking points. After all players have played 6 cards they rank themselves based on points and score victory points based on their ranking. Most of the card abilities involve giving points based on various conditions in a players tableau. For example a card may give you points if there are no cards with a higher cost or give you points for every other fire card you play. Both rounds of the game flow very smoothly and feel quite cohesive, even though each of the two types of round are very different. The game play is also very intuitive and makes sense as soon as you start playing. The rules are very well written and easy to follow. They flow nicely and don't read like a technical manual. In addition they have the three things I always want to see in a rule book, examples with pictures, a FAQ, and an index. It also includes a very variants rule set in they back which is always nice once you've played the game a lot. Even though I don't play too much anymore, I spent years playing competitive Magic:The Gathering (I've even got a few lifetime pro-points), and I can say very definitively that this game does an amazing job of capturing the feel of those tournaments. It's not an exact simulation but you can tell that the designer has had some experience going to these events. There are a lot of little touches that really shine too. From pro-player cards you get from winning tournaments to having the backs of all the cards actually look like a booster pack, these small things really shine through. As far as the game within the game, it has a very Yu-gi-oh feel to it, with all the characters, cards and set names being pretty ridiculous. I thought this would bother me but I actually love it. It cracked me up whenever I said the name of any card and I think it would bog down the feel of the game if they made it brooding and serious. This is where the game suffers a little. There are 38 different card sets in Millennium Blades and every game you shuffle 13 of these together. While this give the game a huge amount of variety, set-up and takedown can be something of a chore. You definitely need to have everyone help shuffle the giant store deck in the beginning and sort it into sets at the end. The art and design is fun and vibrant. It draws a lot from manga and anime and really brings the game to life. Some people might not like the cartoon-y nature of it, but they be hard pressed to say that the art is bad. The money is paper money but it's bundled into neat little stacks so you feel like you're playing with a ton of money. The downside to this is that the money comes unwrapped and you have to spend the time to sort hundreds of fake bills into stacks of 10 and wrap them with stickers. I understand it probably isn't feasible for the publisher to do this ahead of time without greatly increasing the price, but it's still a pain. So let me say up front that the cost and theme may turn people off, but if you are interested in the game and worried about either, don't be. The MSRP is a little high but at the time of writing this you can get it on Amazon or CoolStuffInc for a little less then $60. That price is not high for the amount of replay ability you get here. With 38 different unique decks that you mix in groups of 13 each game, it'll be a long time before you get tired of it. On the issue of theme, even if you've never played a CCG in your life, the game play is so fun that it doesn't matter. Plus there are a ton of great board games with boring subject matter like trading spices or city planning and that doesn't hurt any of them. This game is absolutely fantastic. It looks great, has an incredible amount of variety, and while easy to learn, is filled with deep strategy and choices. More then anything though, it's fun! It was a sheer joy to play this and I'm already looking into picking up some expansions for it. I absolutely recommend this game, go buy it now!